When your RaspberryPi is unstable, this mostly is a power issue. The Raspberry needs a “high power” more then 2A (5V x 1A = 5W) power supply. If you connect Bluetooth, WiFi or other wireless adapters, a power supply of more then 2A (5V x 2A = 10W) is recommended. In the above picture the USB hub is connected to grid power. 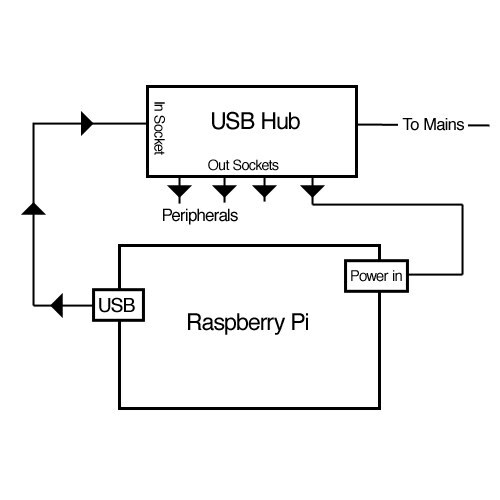 The RaspberryPi is connected to one of the output sockets of the Powered USB hub and one of the RaspberryPi’s USB ports is connected to the input socket of the Powered USB hub. In this case the Powered USB hub supplies power to the RaspberryPi and all the device connected to the USB hub. The RaspberryPi is connected to the Hub and can communicate with the USB devices connected with the hub.